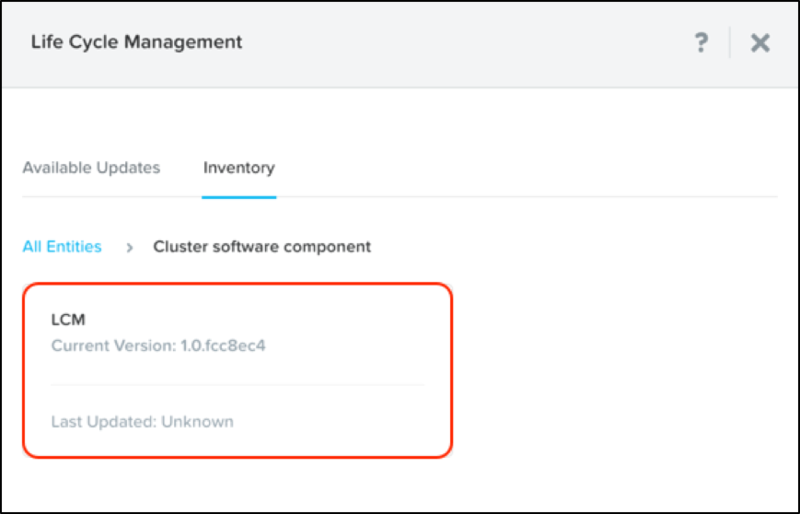 Life Cycle Management (LCM) is a new feature in AOS 5.0 that enables you to update the software and firmware of your Nutanix clusters. LCM can be installed separately, and going forward, it will have its own release cycle. AOS 5.0 includes the first version of Life Cycle Management, or LCM 1.0. The decoupling of updates from the core Prism functionality will enable you to more efficiently plan your infrastructure upgrade and update cycles. As LCM is decoupled from the AOS releases, we can deliver LCM updates more frequently. We expect to issue many new updates in the next few months, which will support a wider range of platforms, so stay tuned. Another important point to note is that LCM can update itself. The LCM framework is treated like any other entity, which can be detected and updated. Similar to most services on Nutanix, LCM follows a master/slave architecture. The master LCM selects one node at a time in the cluster to apply the updates. Before updating the master LCM node, it relinquishes its position to another slave LCM node in the cluster. LCM persists its configuration in Zookeeper, which is available to all of the nodes in the cluster. AOS interface: This component is dependent on the AOS and is a versioned interface (the current version being 1.0) that interacts with the AOS and LCM modules. Framework module: The framework is the central component, which on one hand, interacts with AOS, and on the other, runs the LCM modules. The LCM framework is the main module controlling LCM operations. The framework is organized as python module, and therefore, can be easily upgraded. LCM modules: The LCM modules abstract the entity level details, such as how to perform inventories and updates on a given platform for a set of entities. LCM operations are executed sequentially on the selected nodes in a cluster. These are irreversible operations and may require service downtime. Therefore, plan your tasks in advance before executing an LCM operation. Before performing an update, LCM runs a pre-check to verify the state of the cluster. If the check fails, the update operation is aborted. All of the LCM operation logs are written to genesis.log and lcm_ops.out . The lcm_ops.out log file records all operations, including successes and failures. In the event of any errors, reach out to Nutanix support for assistance. If you are new to Nutanix, we invite you to start the conversation on how the Nutanix Enterprise Cloud Platform can work for your IT environment. Send us a note at info@nutanix.com or follow us on Twitter Nutanix and join the conversation in our community forums. What do you mean by "may require service downtime"? An outage to VM's or a reboot of the CVM/host? If it's a reboot of the host, does it put the host in maintenance mode and move the VM's off before updating? patrbng You are right. The host may be rebooted before which the LCM framework will ensure that its evacuated by putting the host into maintenance mode which should live migrate all of the powered-on VMs. Before running such an operation LCM will ask the user for their confirmation. So there shouldn't be any downtime from the user's perspective. Perhaps we should re-phrase this. Thanks for your feedback. I haven`t a chance to setup a demo to test the function of AOS5.0 ,but I have learned a lot from forum, thanks. xiaowei, happy to hear that! Going forward will "One Click" be replace by LCM ? What are the requirements to deploy LCM for XC platform , can this manage BIOS , Firmware , DRAC , NIC , HBA and ALL code upgrade? When LCM is going to use to upgrade ESXi ?